Operations with scientific notation appears to be a simple topic on the surface, however, students get easily confused when manipulating the exponent in order to make computations. 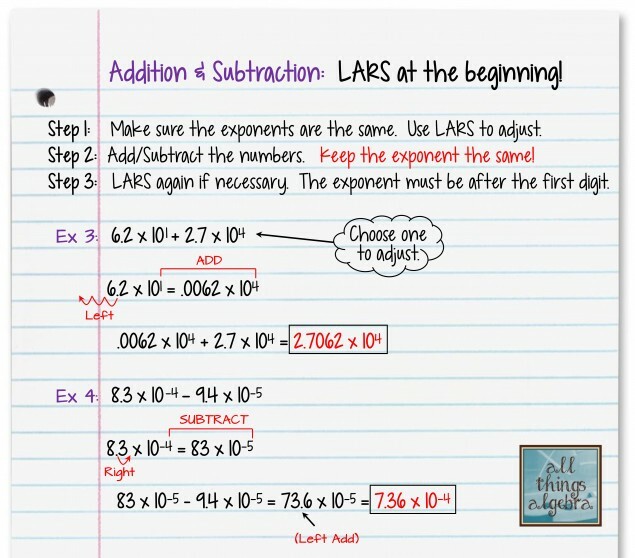 I came up with the acronym “LARS” to help students remember how changing the exponent affects the direction the decimal will move. “LARS” stands for “Left Add, Right Subtract”. If you move the decimal to the LEFT a certain number of places, then you ADD to the exponent. If you move the decimal to the RIGHT a certain number of places, then you SUBTRACT from the exponent. 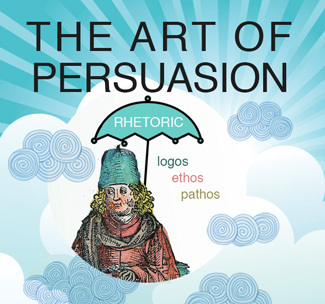 I found this helped my students quite a bit, and myself too! 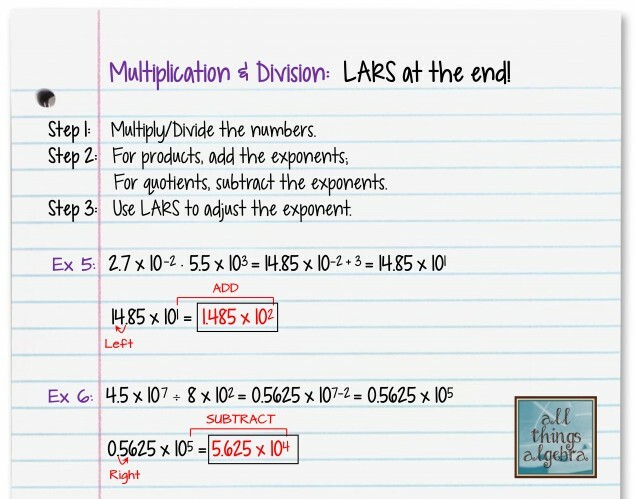 For multiplication and division, students know that they can use the exponent rules for their exponents. Then, LARS comes at the end to ensure that the decimal is in the correct position. 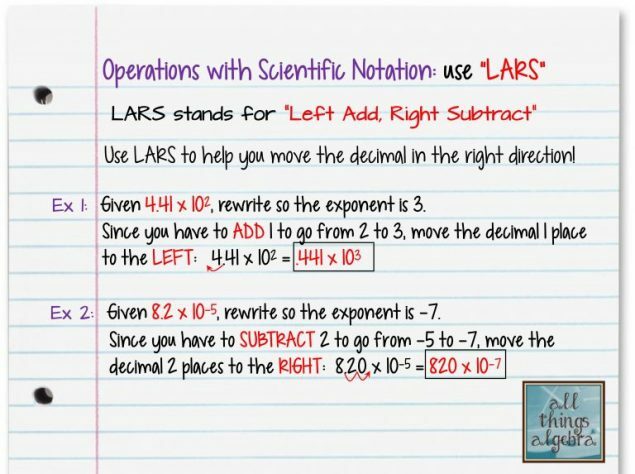 Using LARS to teach operations with scientific notation was truly a game changer in my classroom! 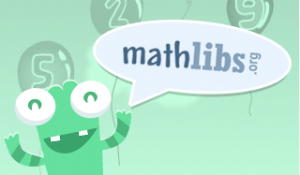 My students find these problems simple, AND, it has strengthened their understanding of “like terms” for addition and subtraction, and exponent rules for multiplication and division. 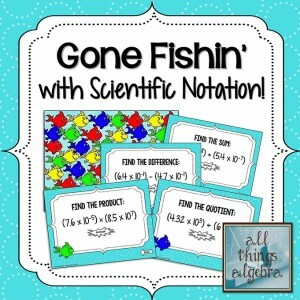 If you are looking for a SUPER fun game on operations with scientific notation, check out my Operations with Scientific Notation Gone Fishin’ Game. It’s sure to be a show stopper! Students can throw a koosh ball at the fish, and they love how the fish really do swim around the screen. Check out a video preview of the game here.